Updated: This second release contains greatly expanded adventures, expanded stat blocks (Essentials-style), new ship types, a much cleaner layout, and many more small improvements. There's this legendary D&D setting: Spelljammer. D&D in space. Wizards and barbarians on wooden sailing ships, flying through space to plunder shattered worlds. Unfortunately, TSR rushed the setting into production, so many of its components suffered from wonky mechanics. It was an imaginative setting that could be frustrating to play. And sadly, it wasn't updated for either the 3rd or 4th editions of D&D. I'm now attempting to fix that. 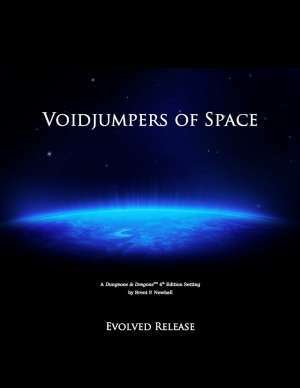 This is the second release of Voidjumpers of Space, an attempt to solve all of those problems. It's free (as in beer); you can donate a couple of bucks if you feel it's worth your money. I incorporate reader comments into each release. I want this to be a community-driven setting. I'm also noodling with the idea of a Kickstarter project to fund awesome art like this. This is an attempt to re-capture the overall flavor of Spelljammer, with a new universe. So, this is not an attempt to clone Spelljammer; it's not Spelljammer with the serial numbers filed off. That would both annoy Wizards of the Coast and be far less fun than creating a new set of races, classes, etc. Head over to my blog, the RPG Doctor, for more information. Thanks for reading; may Voidjumpers find a fun place in your game. > It was an imaginative setting that could be frustrating to play. And sadly, it wasn't updated for either the 3rd or 4th editions of D&D. Sadly, d20 "update" was made - "Shadow of the Spider Moon" article in Dungeon #92/Polyhedron #151. It's little known and had no follow-up, but that's due to being underwhelming. >tagged: "Any system / system-agnostic"
>cover: "A Dungeons & DragonsTM 4th Edition Setting"